The United Nations Human Development Index (2011) ranked Barbados in the highest bracket "Very High Human Development", well above the regional average for the Caribbean and Latin America. Visitors highlight the friendliness of Barbadians as the island's greatest and most pleasing asset. This is reflected in the highest repeat visitor factor in the region of 39%. 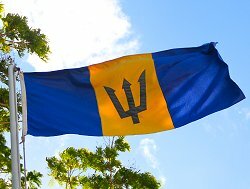 The people of Barbados have a history of long ingrained Christian principles, a sound and free educational system with a literacy rate of 97%. 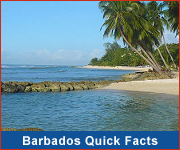 Barbados has the third oldest parliament in the world, with uninterrupted parliamentary governance since 1639. Barbados was the only vacation destination in this Hemisphere with a scheduled Concorde service. One of the retired British Airways concordes now resides at our international airport. Barbados is completely surrounded by the Atlantic Ocean (see where is Barbados). Barbados is 21 miles long and a smile (14 miles) wide! Barbados Fertility Centre is the only full time fertility unit in the Caribbean region. Its success rates are higher than the UK and the USA and treatment costs are a third of the price. 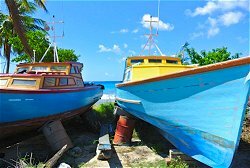 Barbados' cultural diversity helps make the island so distinctively charming. Utilities are available 100% island-wide. 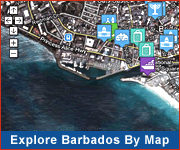 Barbados is easily accessible from everywhere. The maximum daily temperature is 75-90 °F year round. The island is consistently cooled by North-East tradewinds. Sports: Snorkeling, diving, fishing, sailing, waterskiing, tennis, golf and lots more. Weddings: It is possible for ceremonies to take place on day of arrival, providing documents are in order.